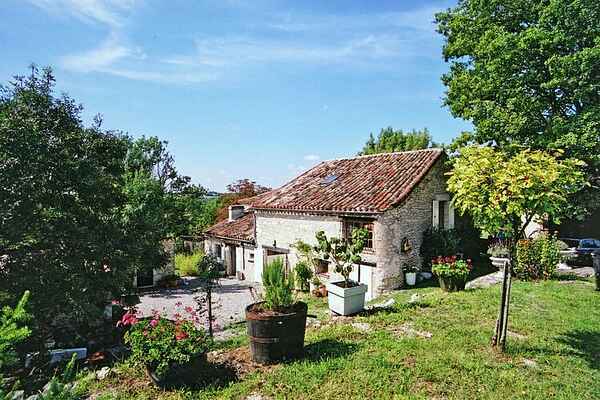 Very generous, former farmhouse, about 300 years old but with all modern comforts. The interior is very attractive, comfortable and very nicely decorated with plenty of room for a larger group. Notice for example the beautiful, decorative side table in the lounge and beautiful wood stoves, both upstairs and downstairs . The adjacent house is also for rent. In front of the house is a large terrace with garden furniture and barbecue. There is a second terrace overlooking the fields and a huge private lawn, where the kids can play while you watch them. The shared pool is on a slightly higher level and on the adjacent lawn you can play football , table tennis or jeu de boules. A bakery, grocer's shop and tennis court can be found in Touffailles, 1.5 km away. More shops and restaurants in Lauzerte and Bourg-de-Visa (6 km). Lot-et-Garonne is the ideal base to explore this historically and culturally rich region. The higher Lauzerte (8 km) is a nice bastide with fine restaurants and a large supermarket. Located geographically between Agen, Villeneuve-sur-Lot, Cahors and Montauban, these cities are certainly worth a visit. Four golf courses are located at a distance of 20 to 38 km.